This post and giveaway has been sponsored by Harry & David. As always opinions are 100% my own! Harry & David is a great resource for the holidays! 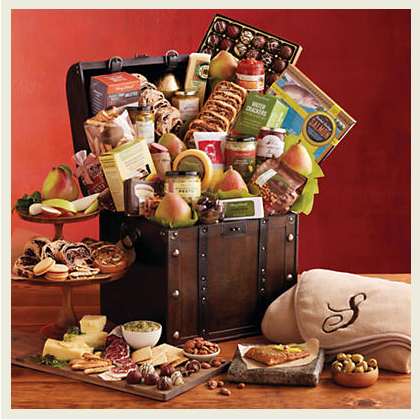 Their gift baskets and gourmet foods are perfect for entertaining, gift giving, and your holiday menus. Harry & David now offers a wine club, wine, cheese, and fruit club, Moose Munch club, and more. Their gifts include delicious goodies as well as a keepsake container. Have you tried any of their gift boxes or packages before? I love the fact that they have both sweets AND healthier options like fruit. Have you tried their fruit? OMG, their pears are SO GOOD! They also have the standard cheese baskets, plus some with wine! Pretty much something for everyone. Guess what? Get 15% off if you spend $75 or more with the code SNOW15 (Exp. 1/15) . Offer is available from 12/1-1/15. This is a great opportunity to take care of office gifts! Oh and did you know that they have flowers and planets too?! Wreaths. Everything you could need gift basket wise. Head over to Harry & David and come back tell me which one you would pick! Best thing? Harry & David is offering up a $300 Amazon gift card to one person!! Enter below. I would buy the The Cheesecake Factory® REESE’S® Peanut Butter Chocolate Cake Cheesecake in a second! Their truffles in any flavor are my favorite item! Ohh I would want any truffle I love them!! I would love to try the CheeseCakeFactory box or the Founders Tower!! I would buy the gournet wine and cheese gift basket at Hrry and David and probably half of the other stuff on there! I never knew they had SOOO much!!! Since I am done shopping for the holidays, I think,I would use the Amazon gift card to buy a needy students in my class some presents, clothes, and food. I have tried their products before but never their fruit. I would like to try the Classic Orchard gift basket. I’d love to try the Maverick pears! I’d like to try the Pears and Stilton Cheese Gift Box. I love, love, love the Riviera Pears!! !